Bobby "Porkchop Cash" is probably well known for his time in various NWA Regions where would win multiple belts in there. The Bearded One would have some decent feuds with the likes of Ernie Ladd,Boris Zhukov,Dr. Wagner,Rock N' Roll Express,and Kamala. He also got into some good tag-teams as well. Porkchop Cash would also wrestle for WWF between July to October of 1988 but only as a jobber. His most notable match there was against Ultimate Warrior. You can watch the match here. Until now Cash still occasionally wrestle and is also a manager in independent promotions. 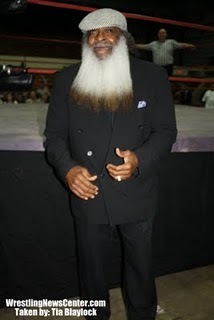 He could also be a candidate for greatest beard in pro wrestling. Just look at this! His name may be funny but Cash's in ring talent and potential is not a joke. Tyson Kidd started out his career on WWE as a tag-team with his cousin-in-law; David Hart Smith and they were managed by Tyson's girlfriend (now wife); Natalya. Both did great and even won the tag-team belts but clearly Tyson was better in terms of wrestling skills in my opinion anyways. When they broke up and Smith left WWE, Tyson didn't do well for himself alone. He was put on various feuds,tag-teams,and storylines but it never got him anywhere. Until now Tyson Kidd still wrestles for WWE but mainly for their developmental brand; NXT. He is actually doing much better in NXT than in the main brands. Him and Cesaro are having a decent tag-team run currently. Shelton Benjamin almost had it all. Great wrestling skills,highflying moves,good looks,and charisma. But there is one solid ingredient that he doesn't have: mic skills. He would put on a lot of great performance and high energy on his matches, have you seen the Ladder Matches he's involved in? Those won't be 100% awesome without Shelton Benjamin! Shelton's career in WWE wasn't bad, he won the US,Intercontinental,and World Tag-Team Championships. But he didn't got a main event match or get to win the WWE Title. Currently Shelton is doing well for himself in independent promotions especially in Japan. Diamond Dallas Page (DDP) started off his career as a manager in AWA on 1988. Until on 1991 he got recruited by WCW and while on his stay there he got to held multiple titles such as WCW Heavyweight Champion,2x WCW US Champion,WCW World Tag-Team Champion,and WCW World Television Champion. He is also the fourth WCW Triple Crown Champion and the only man to defend the US Heavyweight title at a PPV where he defeated Bret Hart at World War 3 1998. Also on his stay in WWE he managed to win the European and World Tag-Team titles. But even after all of these achievements and being such a great performer in the ring, DDP is still one of the most under appreciated wrestlers. Also despite being a great performer in the ring DDP has suffered a lot of injuries throughout his career having him forced to retire very early. Just like DDP, Tito Santana is an excellent wrestler and has won multiple belts throughout his career but it he never got big just like the other wrestlers in his era; Hulk Hogan and Randy Savage for example. Tito started out his WWF debut in 1979 where won the World Tag-Team titles with his partner; Ivan Putski after defeating The Valiant Brothers. They were close on helding the title for 6 months until getting defeated by The Wild Samoans. He would then be mixed on various feuds with the likes of Iron Sheik and Don Muraco. Throughout his career after the tag-team run with Putski, Tito would win the Intercontinental title twice and won the Tag-Team belt again this time with partner; Rick Martel they were known as The Strike Force. His final stint in the WWF was El Matador. He's pretty much like the Los Matadores but minus the mask and no partner. At this point Santana was pretty much a jobber, it was rumored that he would win the WWF Title with this gimmick on but the spot was given to Bret Hart instead. After he's released in 1993 Tito went onto different independent promotions and until today he still wrestles occasionally. He also still makes appearances in WWE from time to time and getting inducted in it's HOF in 2004. Tito could have made a great main eventer but I guess he still lacks a little bit of charisma. Now here's a talented wrestler who gets rarely spoken of these days. Bad News Brown made a name for himself in Stu Hart's Stampede Wrestling and NJPW before coming in the WWF. He was first known as Bad News Allen. He then got into WWF in 1988 until 1990. Most heels back then would be siding with "alliances" or would just act like total assholes but Brown was a little different, he's a lone wolf as they described him. He would not just attack babyfaces but also heels so you can never trust this guy especially in Battle Royal-type matches! Brown then left WWF after SummerSlam 1990 after Vince failing his promise to him that he would become the company's first black champion. Also Brown as known for his tough attitude. At one time according to Dynamite Kid's book, while taking a bus tour with NJPW, Andre the Giant pulled off some racist comments to Brown. Brown would then tell the driver to stop the bus and invited Andre to have a fight outside. Surely you don't want to mess with this guy! He retired in 1999 due to a knee injury and would later sadly passed away in 2007 due to a heart attack. If you're shocked on seeing Bam Bam on this list then I'll have an explanation for you. Yes, no doubt that he is one of the best big men in pro wrestling history, being able to do highflying moves despite his weight and even made a name for himself in various promotions such as in WWE,ECW,and Japan. Bam Bam has A LOT of potential on being a main eventer but it seems like Vince never saw that despite being such a talented wrestler. I guess the lack of mic skills is one of the big reasons for this. After he got released in WWE the second time, Bam Bam would continue to wrestle in various promotions but he sadly passed away in 2007 at the age of 45. Despite being known as "The Man of 1,000 Holds" and one of the best technical wrestlers of all time Dean Malenko will always be an underrated man. The cruiserweight division back then was one of the main highlights of pro wrestling back in the day especially in WCW. Eddie Guerrero,Chris Benoit,Rey Mysterio,and Perry Saturn would go on to become big names for themselves and have memorable matches while Malenko? Well he was kinda left alone. Malenko won the Cruiserweight,Light Heavyweight,and US Titles but it he was never close in becoming a main eventer just like some of his friends. His most notable feud was against Chris Jericho. After a few years of stay in the business Malenko retired as a pro wrestler and is now WWE's Road Agent searching and training young talents for the future of the company. Arn Anderson is without a doubt one of the best wrestlers of all time but it seems like he's the most underrated of all the Four Horsemen. Throughout his entire career, Anderson would wrestle a lot of the big names in pro wrestling and would make a name for himself winning belts here and there but it seems like he's work is really under appreciated. Arn would constantly be outshined by his friend and fellow Four Horsemen-member; Ric Flair. Despite both of them are being equally good Flair would just be a much bigger name than him. Anderson is now retired and has been inducted into WWE's Hall of Fame. And the No. 1 spot for being the most underrated wrestler of all time goes to... Lance Storm! No shocker here, Lance Storm was always underrated throughout his career. Lance had great in-ring skills and would later on develop his mic skills as well. He was a long time friend of Chris Jericho, Lance would get to watch his bestfriend be one of the biggest and greatest wrestlers of all time while he on the other hand got stuck in being a generic wrestler. If you're not convinced that Lance was a great performer then just listen to Y2J's comments about Lance on his dvd that he was "jealous of his great talent." He isn't a big guy but he competes aggressively and could also have a lot of potential. Since he never got big in the wrestling world, Lance Storm would later on fall into obscurity after being inactive in wrestling due to injuries as well. NEW BLOG POST NEXT WEEKEND!